A Grade 2 listed building in Derbyshire’s Hope valley has undergone a major upgrade and refurbishment process which saw its entire heating system upgraded and improved, a news report can reveal. Goosehill Hall has received a new heating system combining ground-source heat pumps and Jaga Strada DBE radiators, which were used in various bedrooms, bathrooms and living spaces. Mini Freestanding DBE radiators were chosen to fit into pre-existing alcoves in the ground-floor dining room. DBE (dynamic boost effect) fan units attached to the radiators’ heat exchangers draw air over the element to increase the efficiency and responsiveness of the heating performance. DBE is combined with Jaga’s Low-H2O radiators to achieve the required heating output through small, aesthetically accommodating radiators. The low mass and low water content of these heat emitters can reduce energy use by up to 16% compared to traditional steel-panel radiators. Further savings can be attained by combining such highly efficient radiators with the HeatSave thermostatic radiator valves, the easiest to install and most cost-effective energy-saving measures on the market. 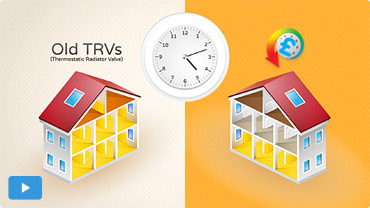 They are particularly suitable for retrofitting, since one simply has to remove the existing TRV and replace it with the HeatSave unit.